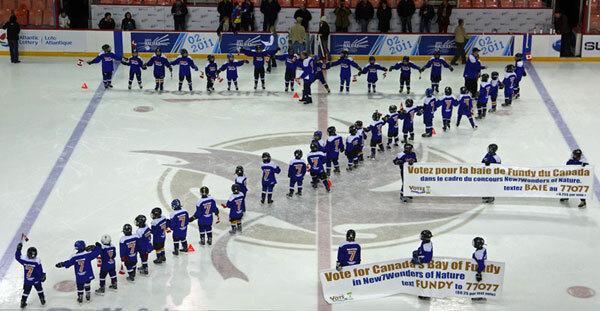 Bay of Fundy youth show their support for the Bay in its bid to become one of the New7Wonders of Nature by forming a giant 7 during the national TV broadcast of the Canadian men's hockey final. The modern game of ice hockey evolved in Canada during the 19th century. The games of British soldiers and immigrants, influenced by stick-and-ball games of First Nations, turned into a sport played on ice skates. On March 3, 1875, the first organized indoor game was played at Montreal’s Victoria Skating Rink between two sides of nine-player teams. Instead of a ball, the game featured a puck and the match lasted 60 minutes. In the photo above, Bay of Fundy youth steal centre ice during the national TV broadcast of the Canadian men’s hockey final by forming a giant 7 to support the Bay in its bid to become one of the New7Wonders of Nature.